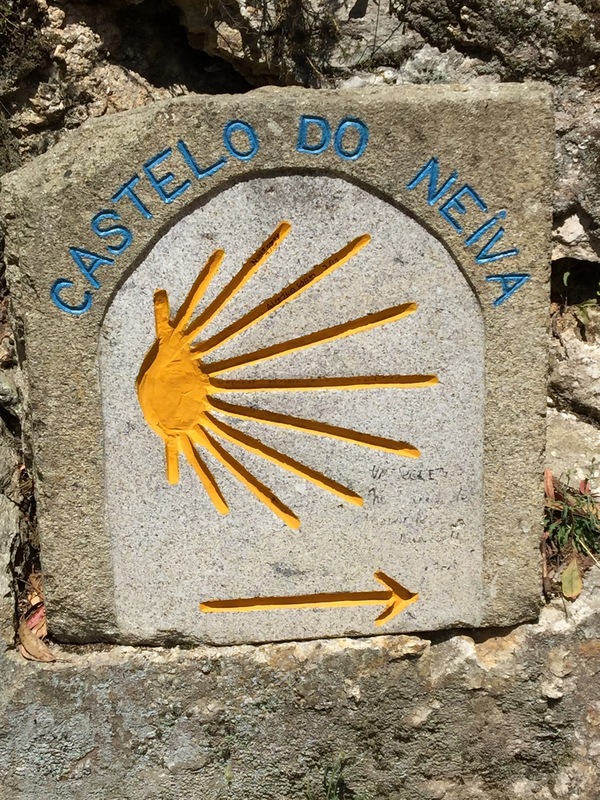 Thousands of people come to experience the Camino each year. The majority are walkers; but, about 22 percent are cyclists. There are various routes; the most popular ones start in France; but, also several from Portugal and some from very far flung places. 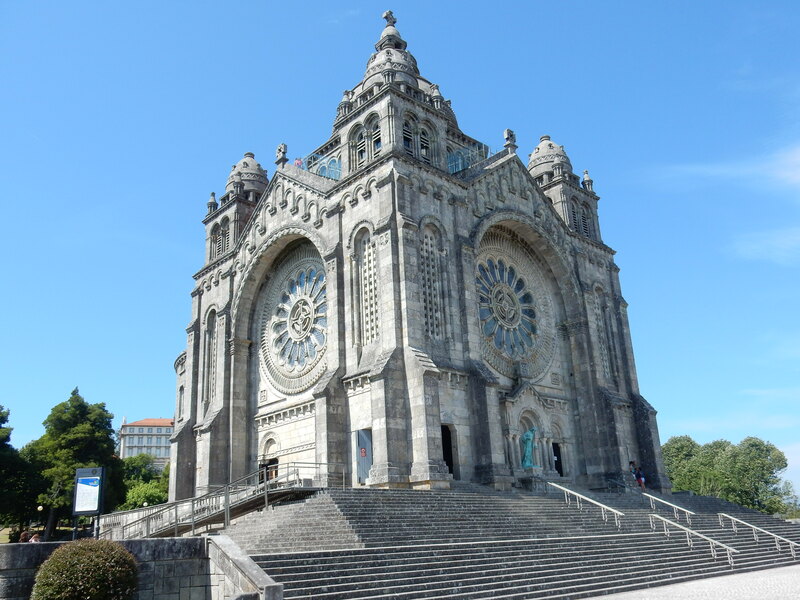 We settled on a Portuguese route that began in Porto, Portugal’s second largest city, and followed along the Atlantic coast area, before turning off inland to join the Portuguese Central Route and cross over into Spain to Santiago Spain. 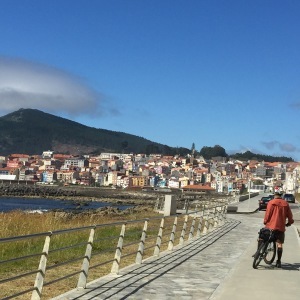 We had thought about cycling the Santiago for about a decade and it finally moved to the front burner when we found the Portuguese way. This had advantages for cycling and it just plain looked beautiful. This was to be the year. We had all the plans in place, plane tickets booked, lodging, GPS routes, cycle rental and two friends who were anxious to join us. 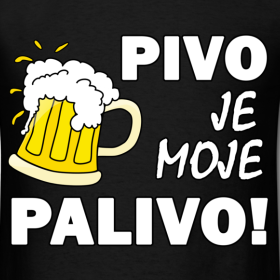 Well, best made plans……. 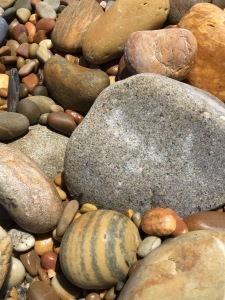 About a week before our scheduled departure, Rick was diagnosed with a kidney problem and his doctor said it would not be advisable for him to ride the bumpy trails and cobblestones; but, she urged us to go. Then I toppled from the bike and broke my wrist in two places and my doctor said that I absolutely should not ride until this was healed. BUMMER! We were more than disappointed and also, didn’t want to disappoint our friends. After a heart to heart, Joe, who had walked the Santiago on another route, mentioned that often walkers found it impossible to walk parts. Injuries happen to everyone. He said that there is abundant and inexpensive transport throughout and we decided to go for it. Although we were disappointed we could not ride, we joined our friends, met each night and since Joe wore the GoPro and Mary navigated with the Garmin, we got to see some of what we missed. They also had lots of stories. We still enjoyed ourselves and would like to return in the future to ride this. Our flight was Seattle to Paris with a connection to Lisbon, Portugal’s largest city. 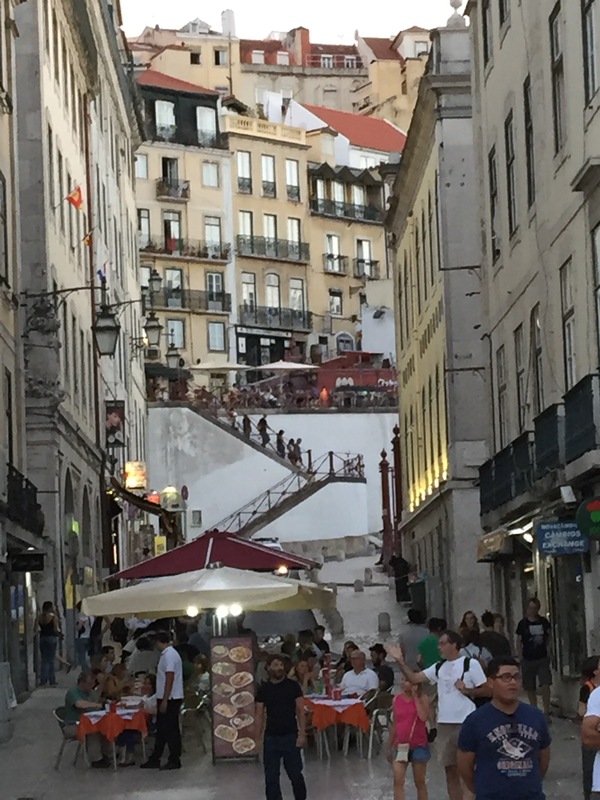 Our planned route started in Porto, Portugal’s second largest city, so we made haste on arrival in Lisbon to get to the rail station for one of the frequent trains to Porto. 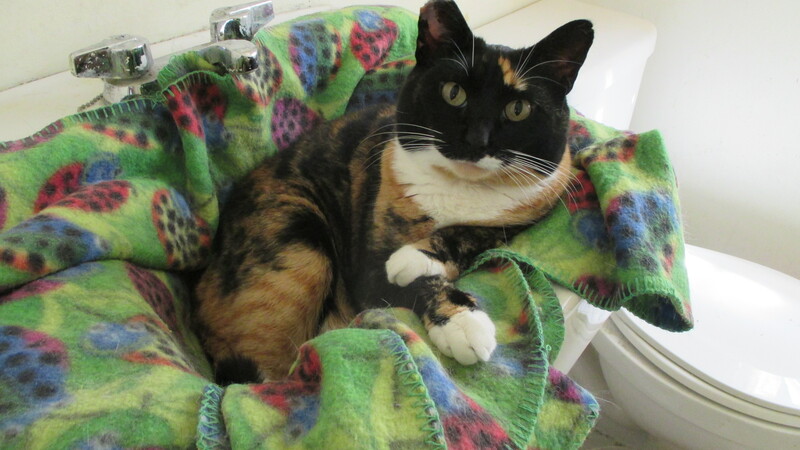 We wanted to spend some time in both places to bookend the trip. 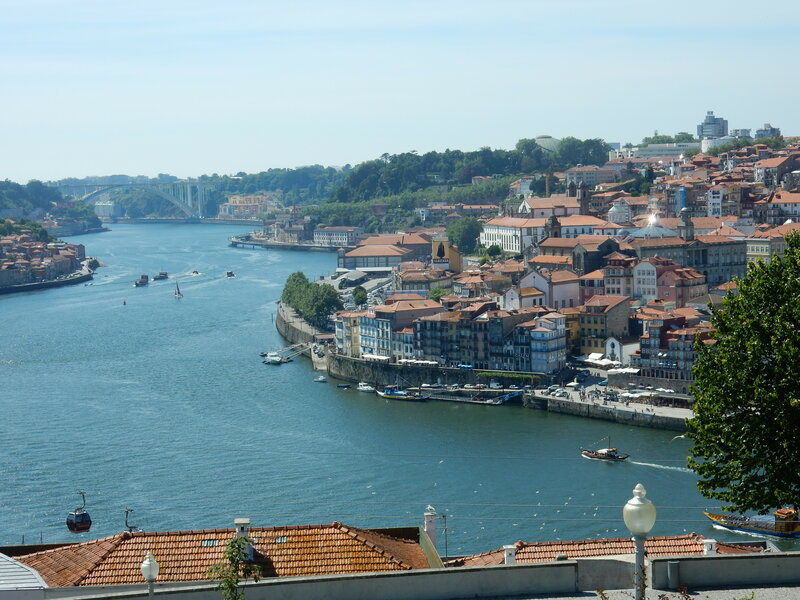 Our route starts in the colourful UNESCO World Heritage City of Porto. 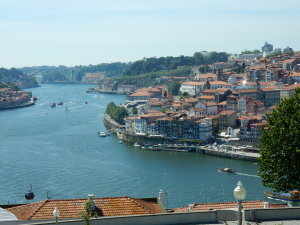 Porto is superbly located close to the Atlantic Ocean and overlooking the River Douro. It is one of the most ancient cities in Europe and its Old Town was born and developed from the Northern bank of the river during the Middle Ages. Palace of Bolsa, D.Luis Bridge, Medieval tower and the Cathedral are particularly worth visiting, as is a nice stroll along the riverfront. 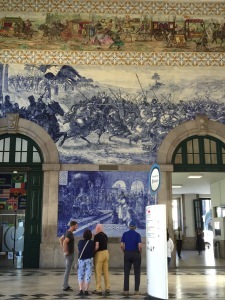 The old rail station of Sao Bento is a work of art inside, with ancient tile scenes adorning it’s interior. 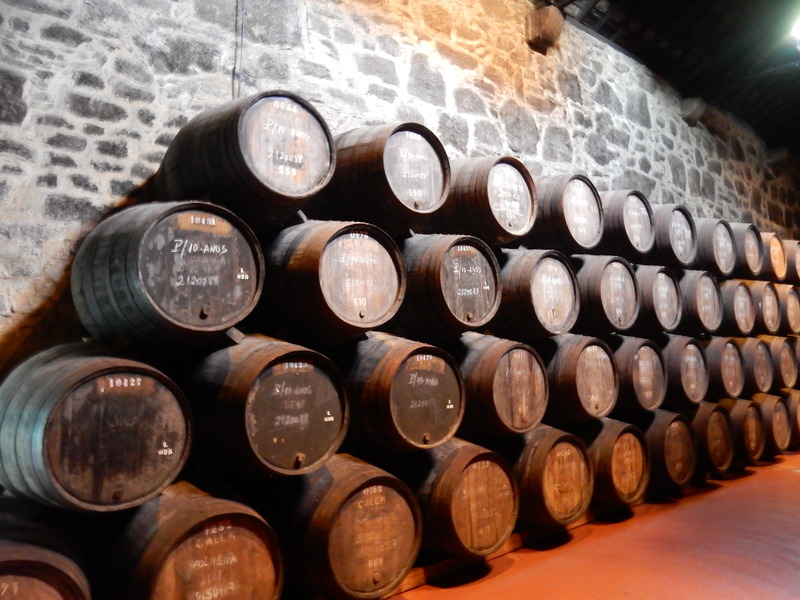 Also, it is fun to visit one of the Port Wine houses to discover the history of this drink and end with a delightful tasting. 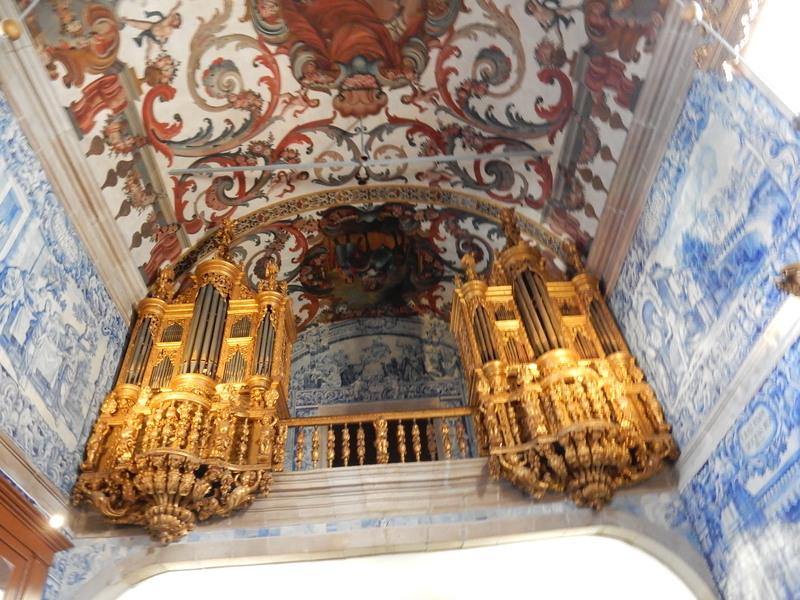 Our tour of The House of Cálem lasted about an hour. The host was an expert of the wine-making process; he was entertaining and knowledgeable. Stage One: Porto to Vila do Conde. The rental bikes had been ordered through BikeIberia in Lisbon and were delivered to our hotel and were to be picked up at the end in Santiago Spain. The route began with a downhill ride from our lodging, down the cobbled streets to head out of town beside the river. There are bike paths along the river, some boardwalks; but, also plenty of cobbles. It is a must to have a mountain or ATV type bike to negotiate all that lies ahead. 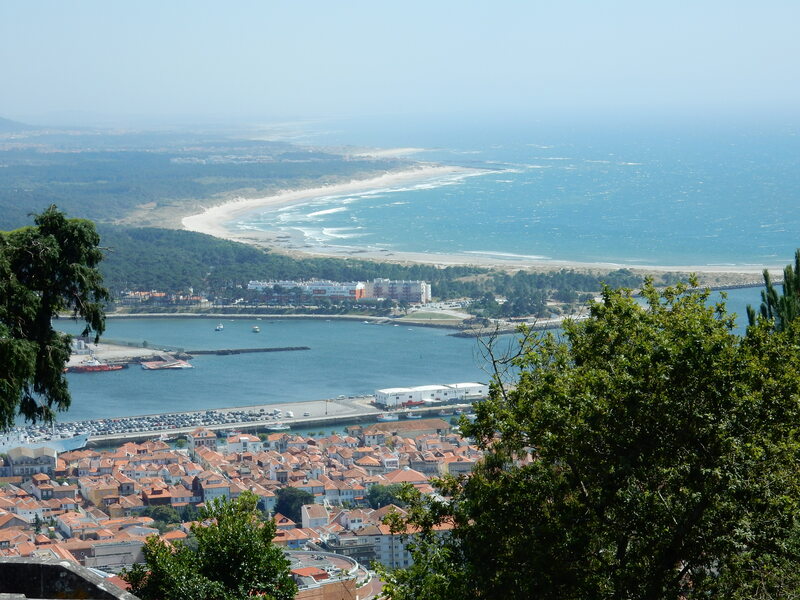 Pass out of town and soon you are admiring the small fishing villages and the beautiful Atlantic coast. 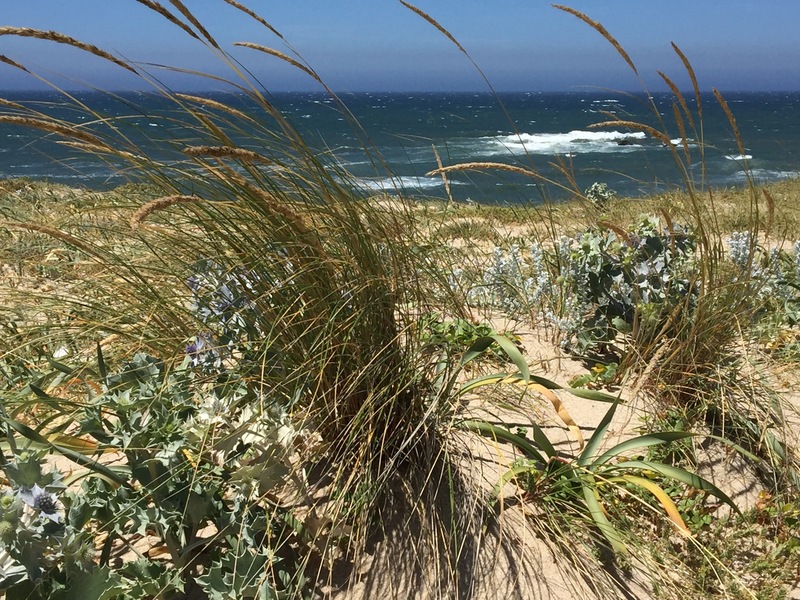 Pass the Mindelo Bird Reserve with it large expanse of sand dunes and beaches interspersed with woodland. At the River Axe, the route crosses the bridge to enter the town of Vila do Conde. The enormous Monastery of Santa Clara, built in 1318, is to the right. 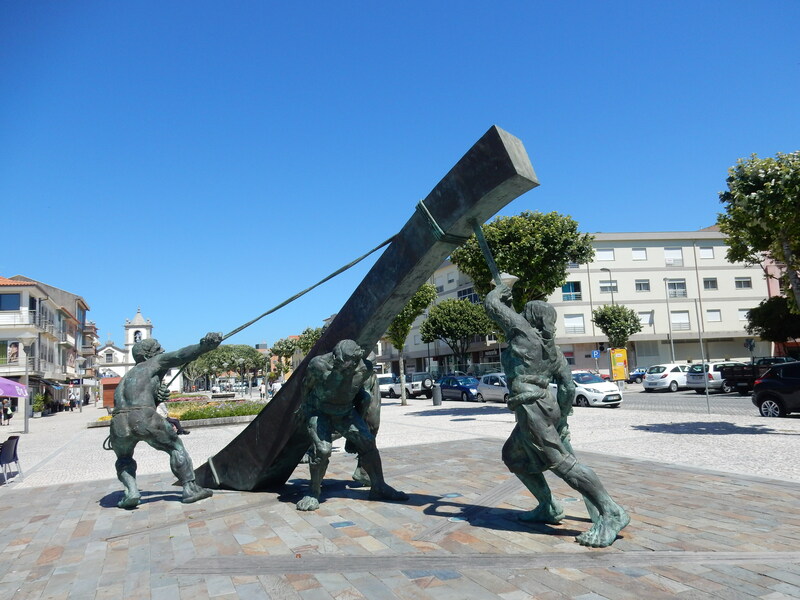 Vila do Conde is an ancient medieval shipyard full of historical and architectural interests whose origins go back to the year 953. The Roman Aqueduct and the Fortress are all worth seeing. . 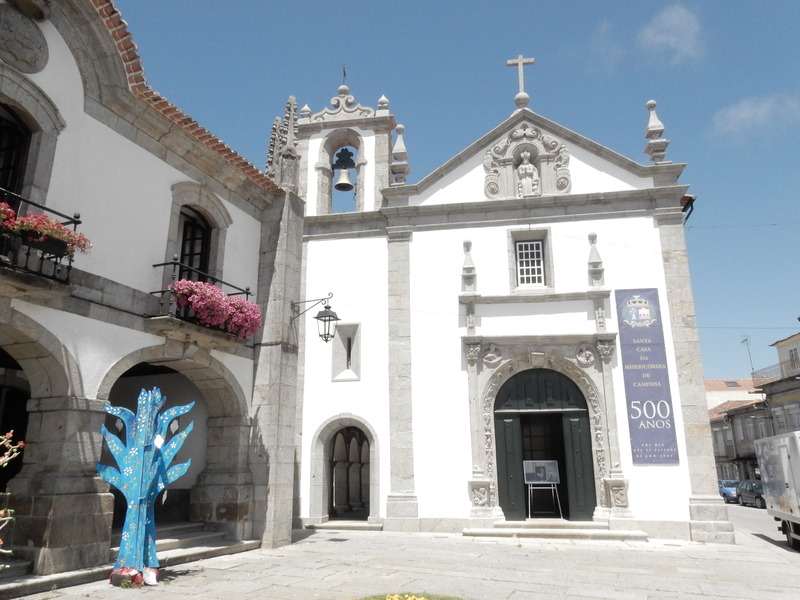 Lodging was right near the bike route and in the morning, it was on through Póvoa de Varzim which merges with Vila do Conde. There is a nice bike path along the beach, all the way. During what was known as the Age of Discovery, these towns played an important role in the building the ships destined for voyages to new lands. Permanent settlement in Póvoa de Varzim dates back to around four to six thousand years ago; around 900 BC. 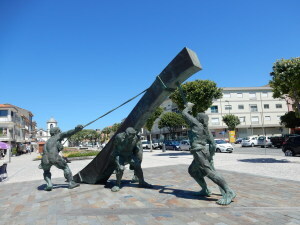 Póvoa became the dominant fishing port in northern Portugal. The route continues north with the beautiful Atlantic again to the left. 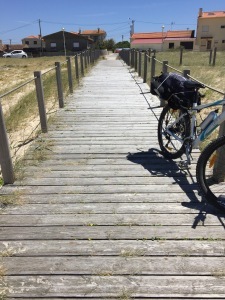 There are bike paths, boardwalks and cobbles today as the route crosses the North Coast Natural Park. 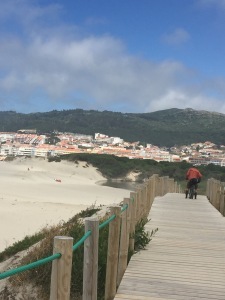 Exiting the pretty village of Fao, the route crosses over the River Cávado bridge and heads on to Esposende. 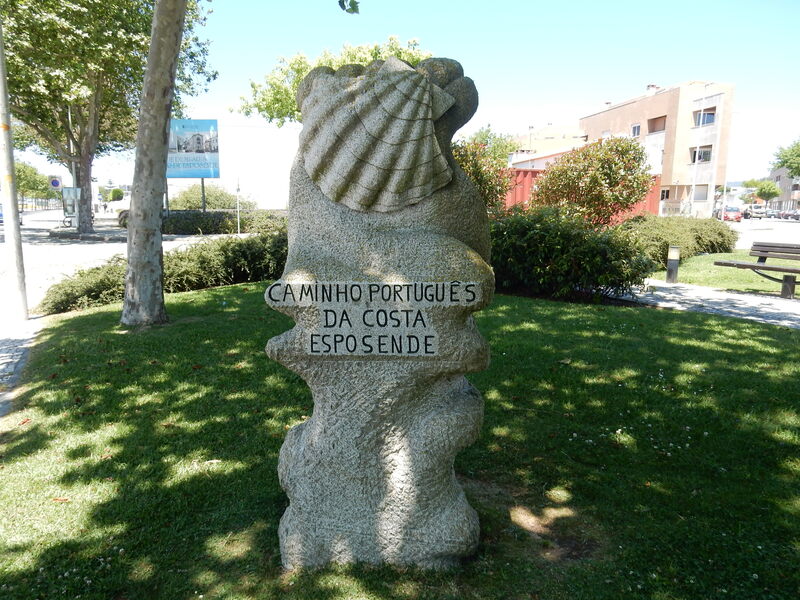 It is an old fishing village with a great setting on the estuary of the River Cavado. There are several lovely churches here. We watched some of the wind surfers who were skipping over the wind swept waves of the river with ease and speed. Today’s ride begins just across from our hotel on a palm lined, two way bike path along the coast and then heads inland for some ups and downs and varying terrain, from bike path to cobbles to rough dirt and rocks; starting with more amazing views of wild beaches and dunes through the heart of the Coastal Natural Park. After about 3km, the route is on a quiet one lane road, shared with a few cars; but, soon seguing into even smaller paths through tiny villages. 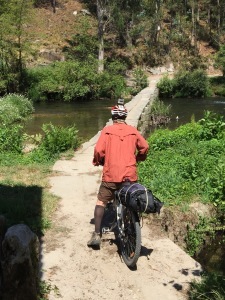 Eventually, the trail turns to dirt and rocks and heads downward to cross the Rio Nieva river on this narrow low bridge with no railing at about 12k into the ride. It is really more of a walkway over the river and rapids below. Then it is uphill on a rough trail once again. Up ahead, Joe and Mary stopped for refreshments and a minor bike repair on a chain and then, off to Viana. The final approach is over Eiffel’s old iron double decker rail and auto bridge, using the left side and walking the bikes over the River Limia to enter Viana do Castelo. It’s a long and busy bridge. At the end of the bridge, there is a double back on the roadway toward the river and then right to ride the scenic small roads to the centrum. After checking into our welcoming Pension, we all headed out to explore. 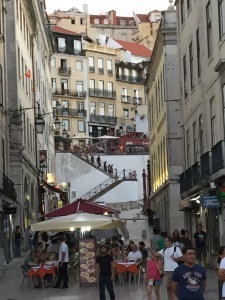 The “elevator” or funicular, will take us up the hill to see the Basílica de Santa Luzía. 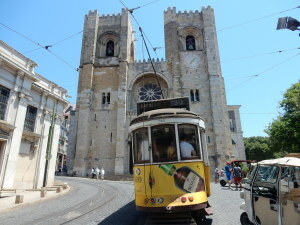 The elevator was featured in National Geographic and is the longest in Portugal. The view at the top is spectacular. Then it was back down to explore the town squares, churches and fort. It has a small town feel; good for wandering. 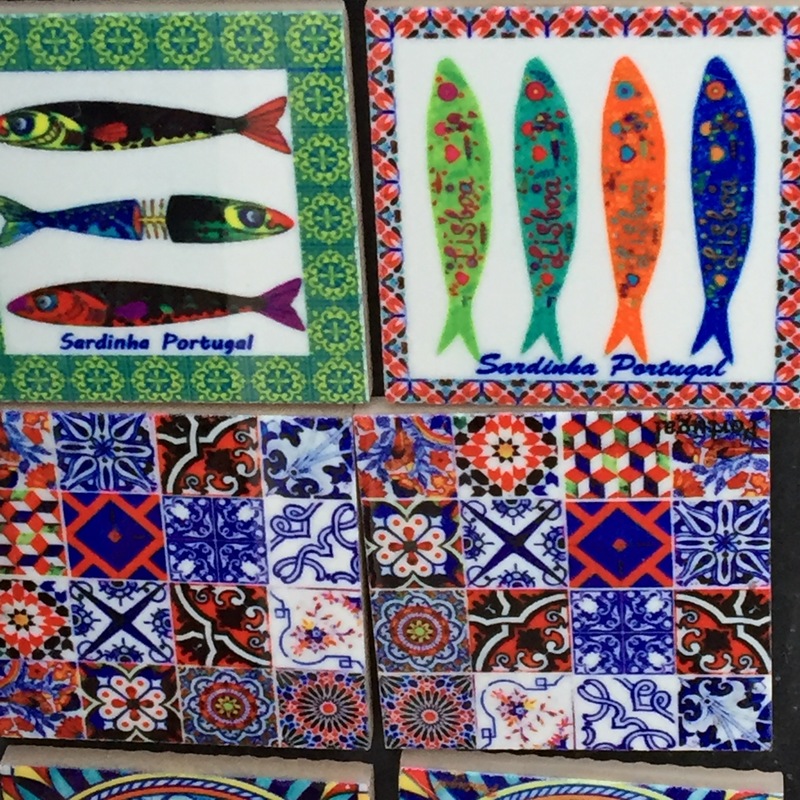 Don’t miss the pasty shops and check out the ladies selling fresh sardines from their street carts. We’ll have some at dinner tonight in one of the many local small restaurants. 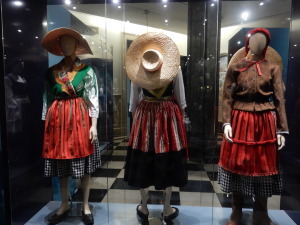 The town is noted for it’s local costumes and handicrafts and there are several museums that are well worth visiting, especially the Costume Museum. At the time of our visit, they also had a special exhibit of Beatles memorabilia, that was lots of fun. 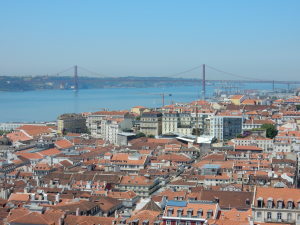 In the 16th century, its port gained great importance as one of the entry-points for Portuguese explorers and traders, involved in the Portuguese discoveries. Many of the historical buildings originated during this period. 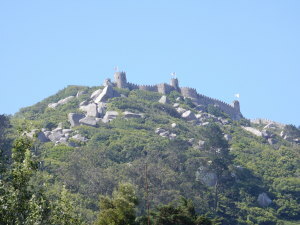 The prosperity that continued, developed from the town’s role as a port, protected by defensive structures to repel pirates from Galicia and north Africa. 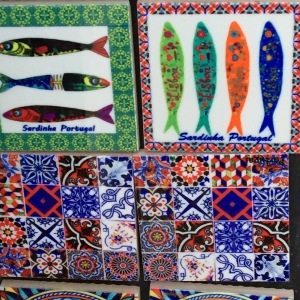 The port’s ties to northern Europe came primarily from exports of wine, fruits and salt, and imports of tile, textiles and glass. Next morning, the route out of town passes the fort on the harbor and then on up the coast, past some small round windmills. The route continues up the coast and through some woodland, which at times runs close to the Atlantic. The beaches are both beautiful and mostly deserted. This was unexpected for summer. 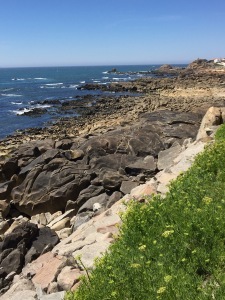 This made for a nice stop for the cyclists to scramble among the rocks and sand. 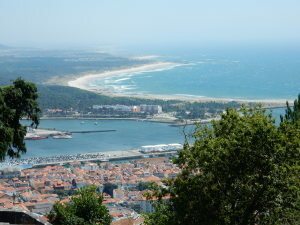 Then it is on to the banks of the River Miño and the approach to the town of Caminha in the distance. The town has an attractive historical core. In Caminha, you need to be aware of your options. 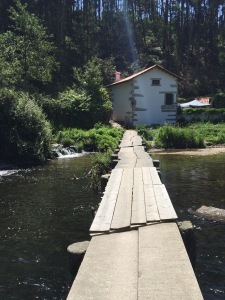 There is a ferry over the river to A Pasaxe in Spain near A Guarda; however, as we found out, their schedule can be subject to the tides and even the whim of the operators! Rick and Sandy made, what ended up being the last ferry of the day. There were only two other passengers in a car. Joe and Mary, just missed this one and, although another was scheduled in an hour, the ferry management had decided to cancel the rest of the scheduled crossings until the next day! What to do, what to do? Long before leaving Seattle, we signed up with the Camino de Santiago Forum. 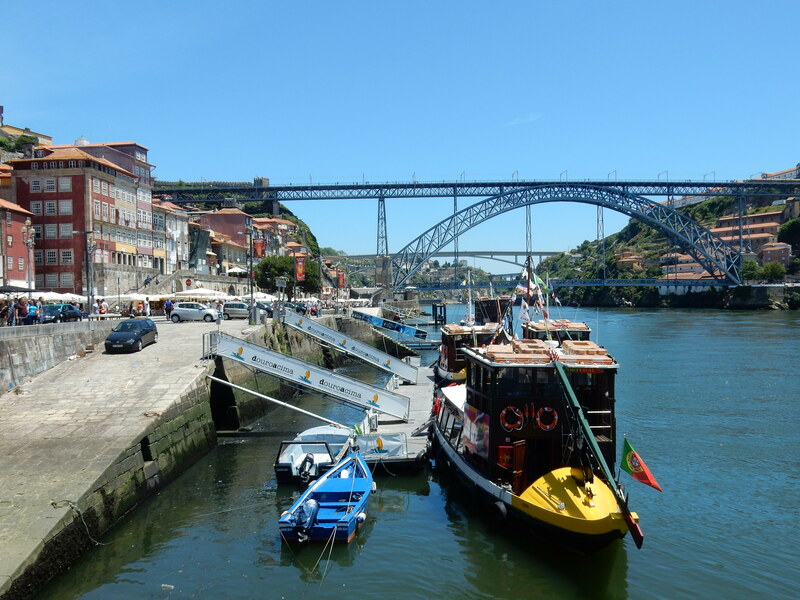 From various postings, we knew that crossing the River Miño was famously problematic. For example, it was reported that the ferry was inoperative for the entire summer of 2014. 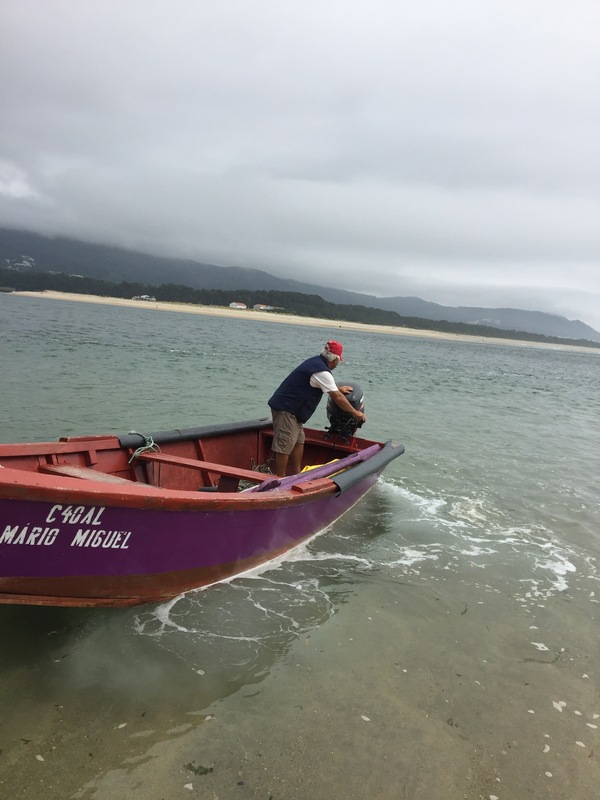 Other forum members had discovered that several fishermen in Caminha were ferrying travelers across the Miño for a modest fee. This tip proved invaluable. After missing the last ferry of the day, Joe and Mary located Mario, who somehow fit the bikes and riders into his tiny boat for the ride across to the beach on the other side. It was a small fee and a memorable event. The map above shows Mario’s alternate crossing of the Miño. 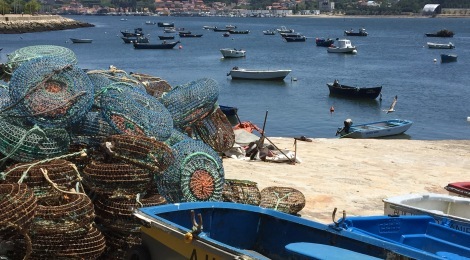 Just ask any of the fisherman in Cominha. Mario’s not the only one. 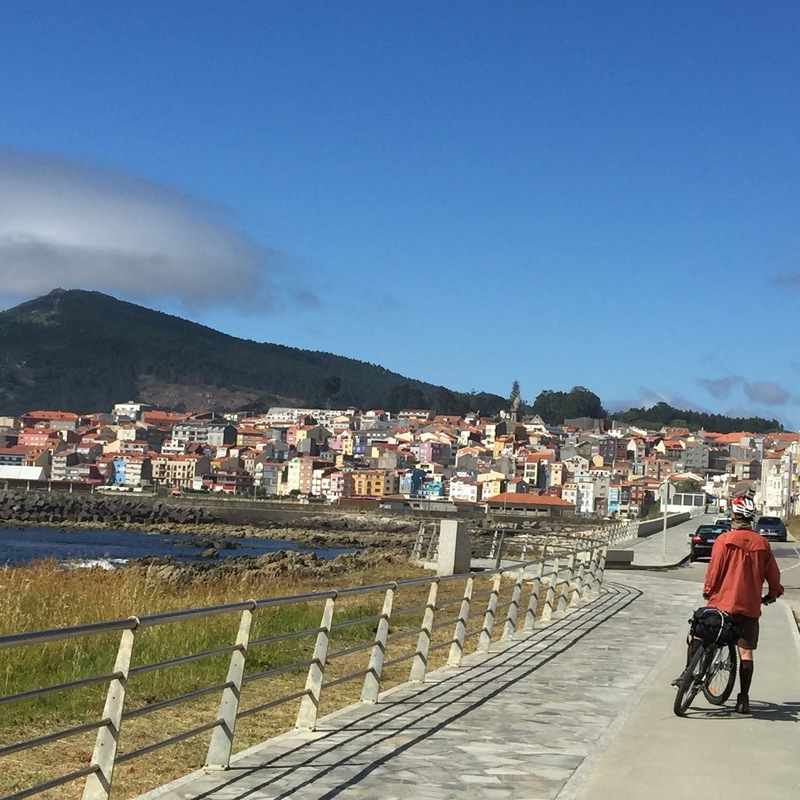 This turned out to be an even better option than the ferry, as it avoided one last hill and made an easy and spectacular approach to A Guarda along the bike path up the rocky, rugged coast. What an approach! 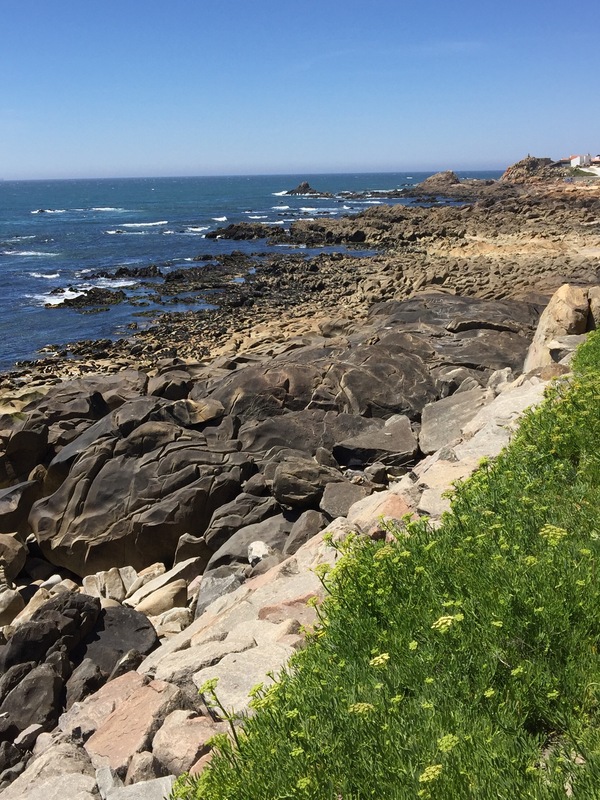 The huge rocks of varying colors, as well as the crashing waves and sand make this a great entrance to our first town in Galician Spain. 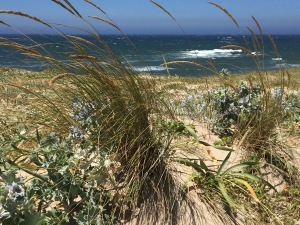 It has been designated a European Destination of Excellence (EDEN) by the European Commission in recognition of its proposal for sustainable tourism. 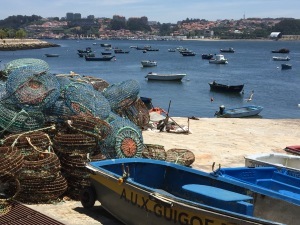 Overlooking the Atlantic Ocean and presided by the Miño river and the Monte de Santa Tecla hill fort, the town of A Guarda is famous for its lobsters. 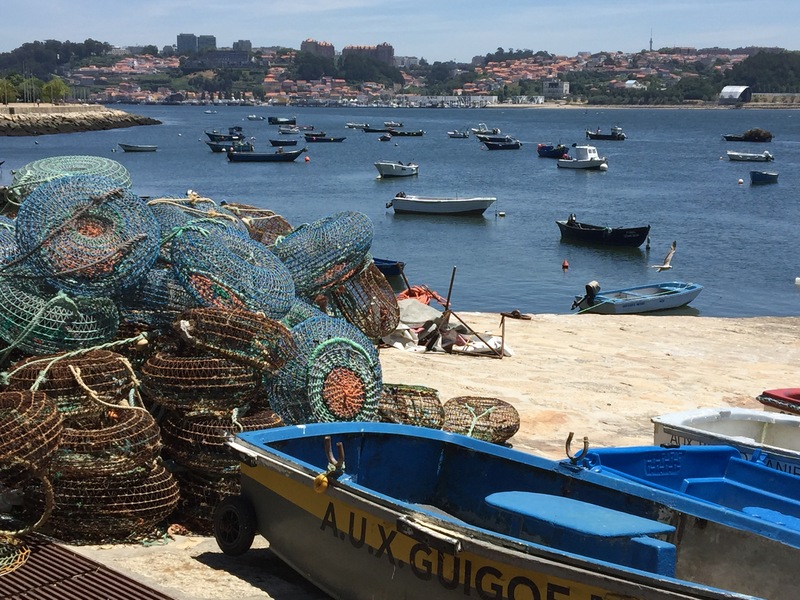 This landscape features elements of the sea, the river and the mountains, and is home to one of the most typical fishing villages in Galicia, on the border with Portugal. 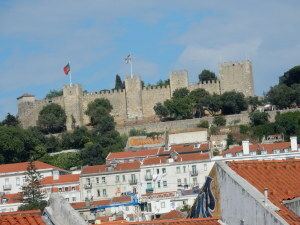 Its situation has meant that throughout its history A Guarda has been conquered by vandals, and Norman, Saracen, Portuguese and French pirates. Its monuments include the monastery of Benedictinas (1558), the parish church raised on an old 10th-century religious building. Fishing has also played an important role over the centuries, and although most of the fleet is engaged in deep sea fishing there are also coastal fishing boats to be seen. We did not want to leave without seeing the extensive and well conserved remains of a pre-historic, fortified Celtic hill settlement (Santa Tecla) situated high up above the town in the wooded Monte Santa Tecla, which was only discovered in 1913! The Celta as its known probably originates from about 500 years BC and there are remnants of over a 100 huts inside an encircling wall. Some have been fully restored with thatched roofs. There is also a stone circle, a church and Celtic museum. The views from the top in every direction either looking at the Atlantic Ocean or inland towards Portugal and the Miño river valley. We saved ourselves the long and steep bike ride up the narrow winding hill road and took a taxi. Turns out the driver is a cyclist himself. His fare was more than reasonable and he waited for us to visit the museum and tiny church and take pictures of the view. 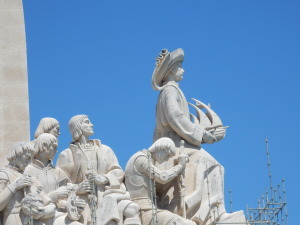 *See our Spain route on the blog, as the Pilgrimage route continues on though Spain to Santiago de Compostela. We left Santiago on an early train, with a transfer to another train in Vigo and the final transfer to a train in Porto to take us to Lisbon. 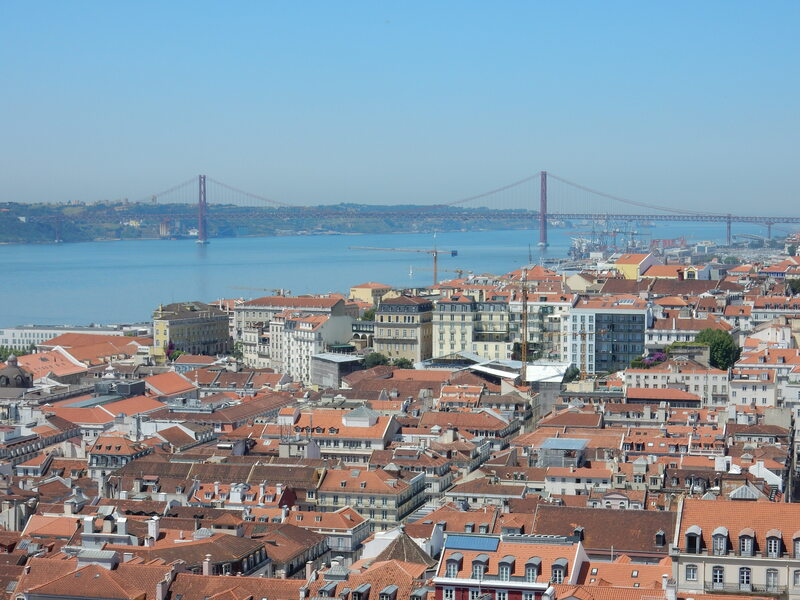 We had not yet visited Lisbon and we made this our last stop of our tour to spend a few days of sightseeing. There is much to see and some very steep cobbled climbs; but, the reward is great views. 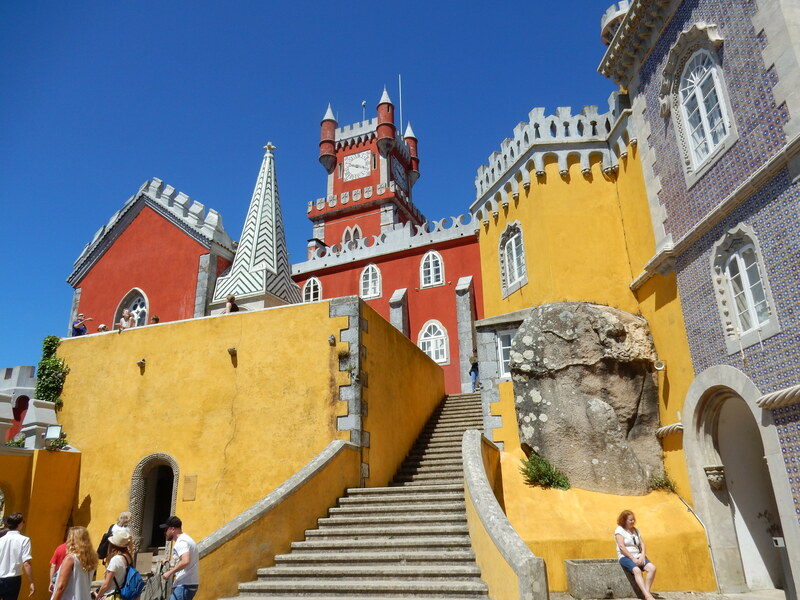 Our highlight was a side trip to Sintra. 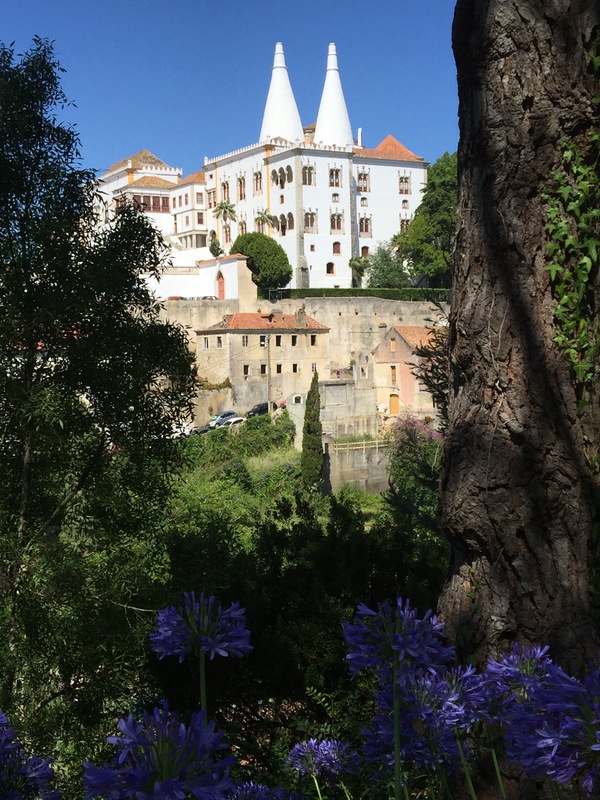 It is about 45 minutes from Lisbon via rail and a world away in the hills. This is another UNESCO site. 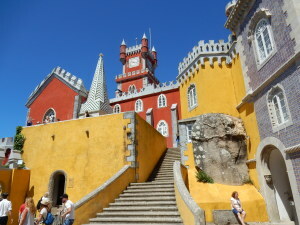 The colorful Pena park and palace, high on the hill are a must see. This was the summer home of kings. It is a very long walk up, so most everyone opts for motorized method to reach the top. There are buses and plenty of TukTuks available to the trip up. The town of Sentra is a great place for our final souvenir shopping. 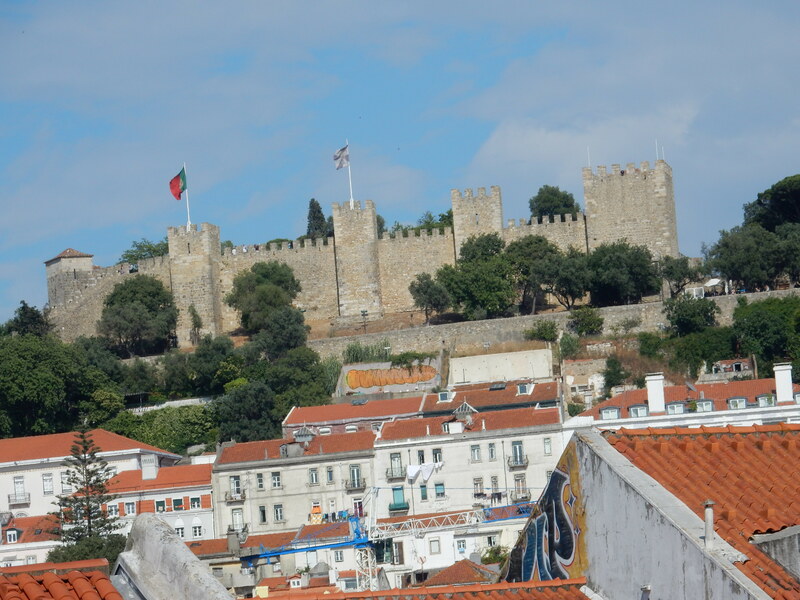 Back in Lisbon, our final day went too fast, as we visited São Jorge Castle. Originally an eighth-century bastion, first built by the Moors, with kingly views at the highest point in town. 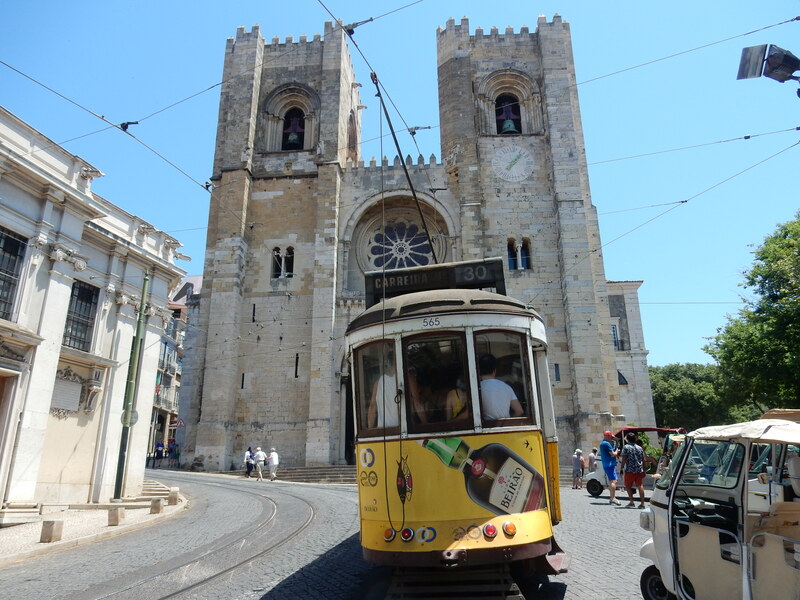 We also took a tram out to Belem to see the Tower, the Cathedral and the impressive waterside monument to the Discoveries Giant riverside monument honoring the explorers who brought Portugal great power and riches centuries.